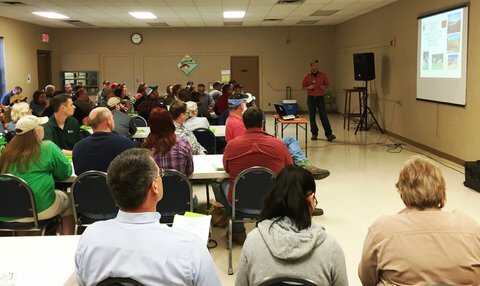 Tennessee AgrAbility (TNAP) networked with Charley Jordan, TN Homegrown by Heroes farmer, to host the first farmer veteran workshop in Clarksville, TN, on April 2nd. Sixty veterans registered and 95 were in attendance. Veterans learned about all the USDA programs available for beginning farmers plus other TN resources available. The staff received lots of positive feedback and are planning more workshops across TN to reach farmer veterans. Charley Jordan is working hard to establish a TN chapter of the Farmer Veteran Coalition. He spoke at the Midsouth Advisory Council of Military Education (ACME) symposium at the Ft. Campbell Education Center. Charley continues to spread the farmer veteran message in Tennessee. THANK YOU NAP for organizing another great conference and speakers! Six staff represented all TNAP partners, networked, and learned at the informative NTW in CO. To-do-lists got a lot longer with all the new ideas, inspiration, and contagious enthusiasm. Thanks also to NAP for the travel stipend for one of TN AgrAbility's farmers. Paula Jones, coordinator of rehabilitation technology services with East Tennessee Technology Access Center (ETTAC), attended the 2016 NTW (first-timer). She went back to ETTAC and presented on the conference. This is a quote from her presentation: "The conference was fabulous. The breakout sessions were very informative and well put together. I received a lot of information on various topics that are helpful for my organization, including accessible gardening. The keynote speakers were excellent! Everything was very well organized. The networking opportunity with people from all over the United States was INVALUABLE! The tour to Craig hospital was great. It is truly educational to see things in person rather than read about them." Tennessee staff has begun the groundwork for the Milan No Till Field Day in July. The staff invited Kentucky Department of Agriculture to attend with their safety demonstrations: grain bin, tractor rollover, 4-wheeler, and lawnmower. Tennessee will focus on health screening and arthritis with massage therapists in attendance. The staff has started the planning for a Tennessee farmer veteran picnic at noon on that day.